"Therefore Krsna consciousness is the highest goal of life. We should always remember. And Bhagavad-gita says bahunam janmanam ante jnanavan mam prapadyate [Bg. 7.19]. After many, many births of evolution, one after another, one after another, one after another -- that evolution is going, every moment -- so when one is perfectly wise, bahunam janmanam ante jnanavan. Jnanavan means perfectly wise. Jnana means knowledge, and van means one who has. The Sanskrit word van... Just like bhagavan. Bhaga means opulence, and van means one who has. So Bhagavan means one who has got six kinds of opulences in full. Every Sanskrit word has got its root meaning. It is not... Just like Krsna. Krsna has got His root meaning. Krsna, 'the greatest.' Krs, and na means negation. There are different meanings, but this is one of the meanings. Another Krsna meaning is 'all-attractive.' So God is great. That very idea is perfectly expressed in the word Krsna. So bahunam janmanam ante jnanavan [Bg. 7.19]. 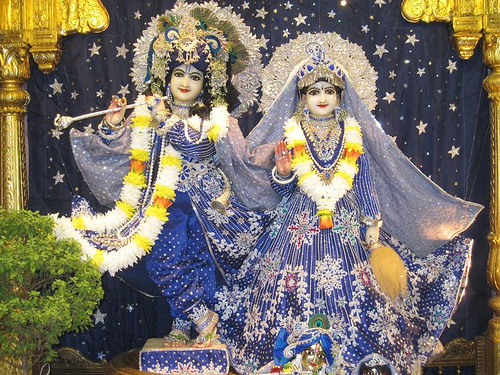 Jnanavan means who has attained, who has possessed, who is in possession of highest wisdom. That is Krsna consciousness. Bahunam janmanam ante jnanavan mam prapadyate. And what is Krsna consciousness? Krsna says, 'One who surrenders unto Me. One who comes to Me and surrenders, My dear Krsna, I now understand that You are my eternal protector, You are my eternal friend, You are my eternal maintainer. I forgot You; now I understand. So I come to You and surrender. Please give me protection.' This is called saranagati. So he is wisest man, and he continues to serve Krsna. That is Krsna consciousness."